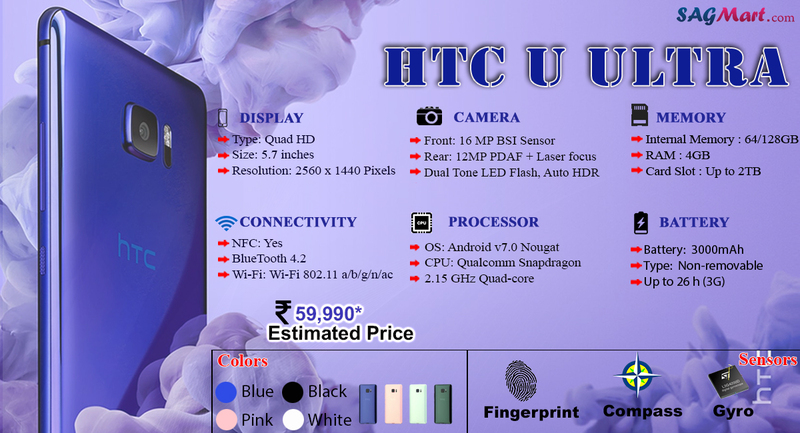 The HTC U Ultra Android mobile comes with 5.7-inch Super LCD with a QHD (1440x2560 pixels) resolution. It has two inbuilt storage model of 64GB. U Ultra is controlled by a 2.15GHz quad-core Qualcomm Snapdragon 821 SoC with 4GB of RAM. It bears a 12-UltraPixel rear camera along with the 16-MP front. The HTC U Ultra features HTC Sense Companion that learns the user's daily patterns to provide recommendations and friendly advice to the user.